I'm having so much fun watching the young birds figure out the feeders. Above is a hairy woodpecker hatched this summer--distinctive because his red coloring is on the top of his head and not the back. The younger birds lack the finesse at the feeders you will see with an adult. This younger woodpecker made large exaggerated pecks at the food. Because his pecking was slow and purposeful, I could capture some great shots with him. Above, you can see he prods his tongue at the suet as well as his beak. 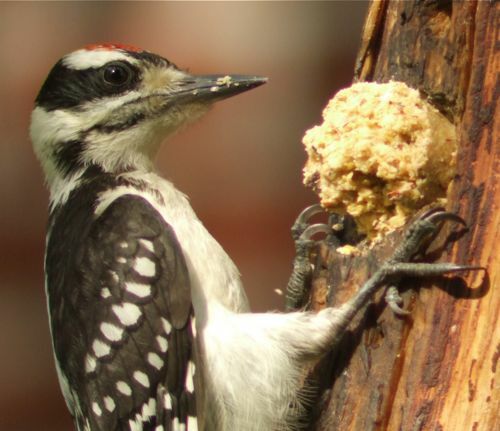 Woodpecker tongues are a source of great conversation for humans, a source of nightmarish horror for squishy larvae embedded deep below the bark of a tree. 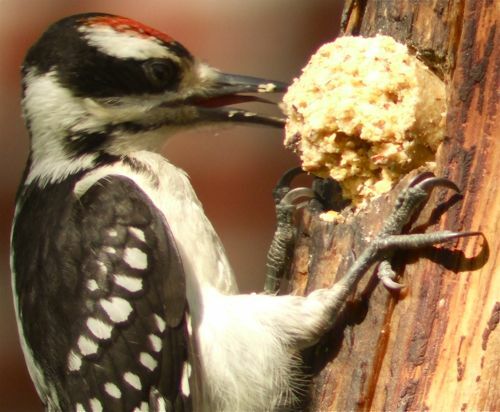 The tip of a woodpecker's tongue is hard and covered with tiny spikes that point back towards the woodpecker's mouth. The tongue muscles actually start on the top of the woodpecker's head and they can extend it out about twice the length of their head. If this suet were some grubs, the hard spear-like tip of the tongue could pierce the larve, locking it on with the barbs covering the tip. Ew.